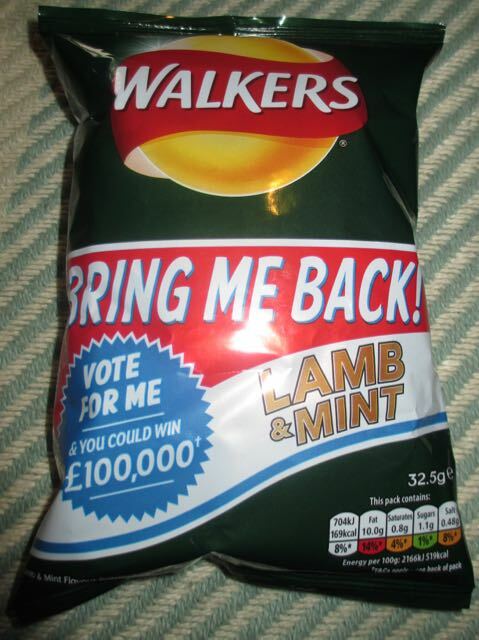 Walkers Lamb & Mint is one of the stranger sounding “Bring me Back” range of crisps, but I do remember them from when I was a youngster (some time ago) as I did get to eat a few packs in amongst the less adventurous Salt & Vinegar, Ready Salted and Cheese & Onion flavours my mom used to buy from the supermarket. As soon as Cinabar showed me all the different packs sent from Walkers I must admit to a little overexcitement and had to nab this packet. There was a strong lamb smell from the crisps with a hint of mint upon opening the packet. On munching the crisps the mint is subtle all the way through the flavour that literally bursts with lamb. I can understand why it would be subtle as the mint may distract from the lovely lamb flavour, rather than the nod and doffed hat towards it with an elegant complement. This was just as an unusual flavour way back when as it is today. I’d definitely recommend it as a flavour that needs to be brought back.